It's like they've created two contests based on my diet. Yes, it's the time of year that Doritos and Big Rock decide that, after the holidays, we're not eating and drinking enough. So, in the sales-promotion circle of life, they roll out their big contests to give out cash, while selling chips and beer by the chipload and barrelful; their sum: a metric shitload! We've already given the Big Rock campaign contest - the Eddies - a shot in my first-year ad classes. In this contest, you have a choice between print and broadcast. Kind of old school: could viral be far behind? Top prize is $1,500 in the print category and - gulp, gulp, glug - $10,000 in the broadcast category. I love go-o-o-o-o-olllllddddd! It's an exciting time of year at school, because this is when it's like a light switch goes on and the ads suddenly start getting crazy and clever - the two Cs of advertising (says me). The irony is that it's because, sometimes, the less you think about writing, the more impactful and emotional it is. Our first-year students are especially overwhelmed at this time of year: IPP proposal, PR proposal, ad campaign, magazine project, shovel snow in my yard (sneaked that one in) - in a delightful twist, there's no time for contemplation. Let's hear it for being overworked! Deadline for the contest is March 31 at 4:30 p.m. Click through on the above link to find out more. 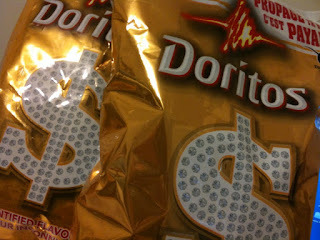 Doritos has its crisp and tasty feet planted a little more firmly in the present day. Its contest involves naming the flavor of its new mystery chips (see above photo - I got the last two bags at Foodfare yesterday), and making a viral video to to promote your name. At the above link, Doritos helpfully provides a playlist of greatest viral videos of all time. Thanks, Doritos, for showing me how to weight my evaluation of an online ad and PR campaign. You rule! The prize structure must be seen to be believed. Top prize is $100,000 and "a potential" $250,000. For me, Moneybags Larsen, that's one week's supply of Doritos. Deadline is also March 31. And now I shall eat and drink my weight in chips and beer.